Freshmen David May and Phillip Mollica will join three veteran players in Clemson’s lineup for the 2005 Carpet Classic at The Farm in Dalton, GA this weekend. The 54-hole, three-day event will be played Friday, Saturday and Sunday. It will be Clemson’s third and final tournament of the fall portion of its schedule. Stephen Poole, who has a 72.17 stroke average so far this year. He is coming off an eighth place finish at the Isleworth Collegiate. He has three rounds at par or better so far this season. Brian Duncan will be playing in his second tournament of the year after an 18th place finish at Isleworth two weeks ago. The senior from Greenville, SC had an 11th place finish at The Carpet Classic last year, best among Tiger golfers. He had a 21 score, including a one-under 71 on the final day to lead the Tigers. Martin Catalioto was Clemson’s best player in the first tournament of the year with a 212 score at the Jerry Pate. He has a 74.67 stroke average for the year. 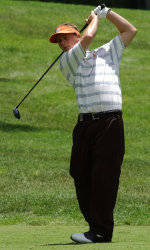 This will be his first appearance at the Carpet Classic since the fall of 2001 when he shot a 232 for the three rounds. May and Mollica will be making their first appearances at The Farm. It will be the second event as a Tiger for Mollica after a solid 220 score for his three rounds at Jerry Pate a month back. May has played in each of the first two events and has a 78.17 average. His best round was a 71 at the Jerry Pate. The Carpet Classic is an 18-team field that includes 11 top 25 teams. The list includes ACC teams Duke (5th ranked), Georgia Tech (2nd ranked) and NC State. SEC teams in the field include Georgia (1st), Tennessee (6th), Florida (7th), South Carolina (20th), Alabama (T-21) and Auburn (T-21). The field also includes Big 12 teams Oklahoma and Texas Tech. Clemson finished fifth at the event last year with a 896 team score. The Tigers have won the tournament four times, with the last occasion being the 2002-03 National Championship season. Clemson has finished in the top three in nine of its 16 previous appearances.